Browse the entire open directory. Translations gladly accepted. Please translate PasswordDialog.properties, Browser.properties, and TulipChain.properties. All you need to do is double click the jar file to start Tulip Chain. Instructions - Basic instructions on how Tulip Chain works. Help - Explanations of all menu items and options. Source Code - Browsable source code. JavaDoc - Source code documentation. Comments - Send comments directly to the author (Stephen "deadsea" Ostermiller). Sites need to be able to have more than one line of the table to describe the site properly. Works with unreviewed sites again. 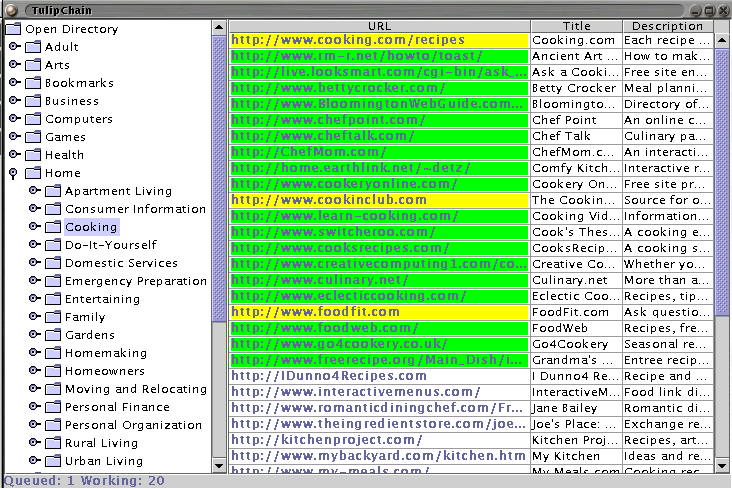 Unreviewed sites come from "raw" tab separated data feed from dmoz.org. Port 8080 is no longer an option to connect to dmoz. Partial reports due to "no such vector element" bug fixed. Corrected link to spell check. Autocorrect no longer corrupts non-ASCII characters in categories that are not UTF-8. Dialog option for changing the locale to one of the included languages. Option to generate a report in any supported language. The stop button will not cause crashes. Opening a browser on Mac OS X will not cause crashes. Connection errors are classified into various types such as no dns, connection refused, timeout, etc. Certain connection errors are marked red instead of orange. A greenbust unreviewed queue can be opened from the right click menu. Uses the HTTPClient libraries to download sites. Knows about greenbust permissions in a category and acts appropriatly. Loading categories from editor dashboard works again. Link to Tulipchain Forum updated. Public and Editor Dmoz hosts are user configurable. Editor server defaults to editors.dmoz.org:8080.